If a distillation came out of Ireland, its pure essence concentrated in a single place; that would be Dunquin I think. 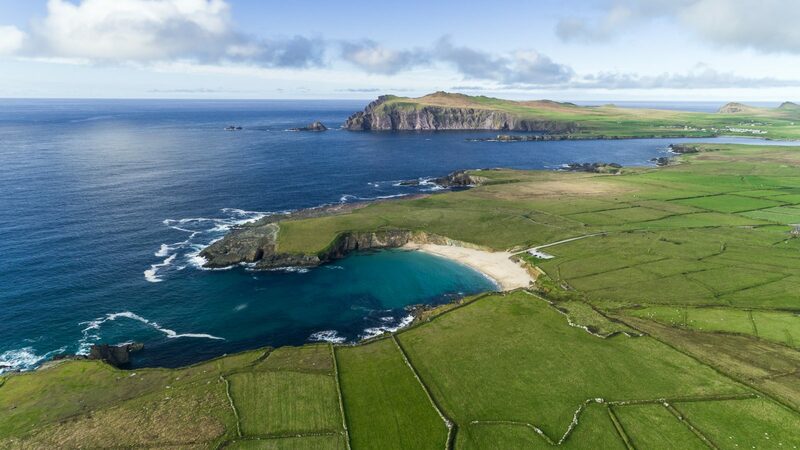 The next parish to America as they call it, is the most western village of the Irish mainland, right on the tip of Dingle peninsula where the prolific green of the meadows is abruptly cut by the deep blue of the Atlantic Ocean. Dunquin (Dún Chaoin in Gaelic) is built on the foot of Mount Eagle, overlooking this eternal battle between earth and water. 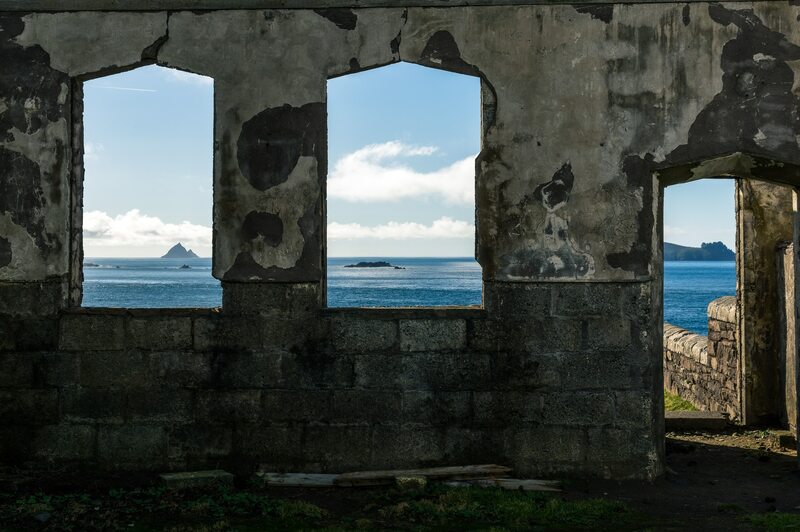 A few miles out in the rough sea, the abandoned Blasket islands endure the passage of time as did the islanders who lived there till 1953, among them some of Ireland’s famous writers and storytellers like Peg Sawyers, Maurice O’Sullivan and Thomas O’Crohan. Not a bad crop for a settlement that never had more than two hundred people and a testament as to how a place can shape a person instead of the other way around. 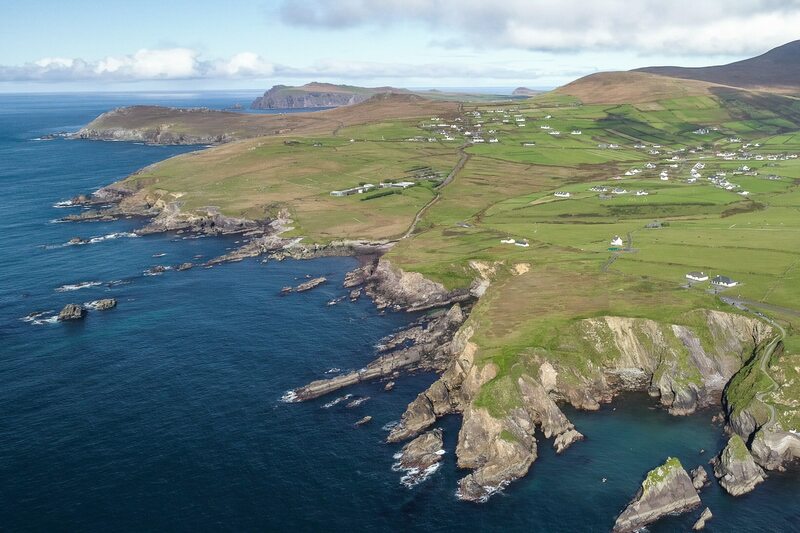 Eventually the island was evacuated and the last islanders moved across the sea to Dunquin, leaving the small village on the north east side of the Great Blasket deserted. The Slea Head Drive is one of the most beautiful road in Ireland. 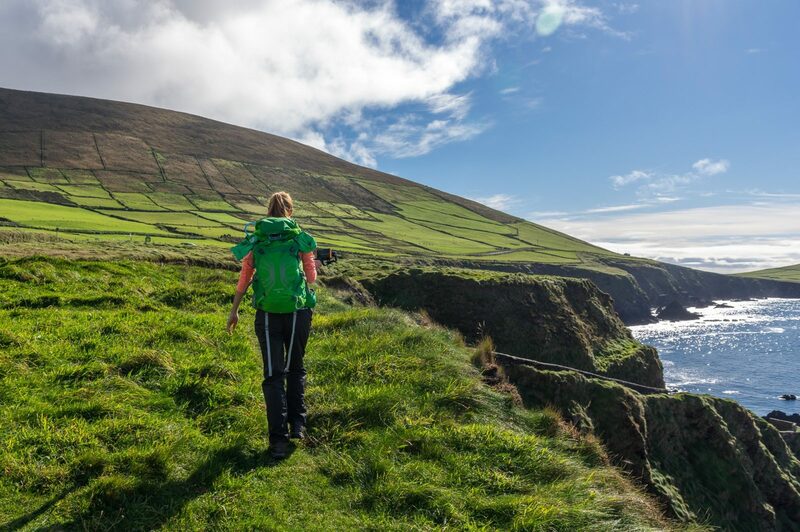 It starts and ends in Dingle and it’s an amazing way to explore the coast of the peninsula. When we arrived it was already ten o’clock in the night. We hadn’t encountered a single soul after Dingle. The single lane country road was so narrow near Dunquin that there were short recesses on the fields here and there, in case two cars met. Not a frequent problem apparently. It was pitch dark when we got there and in order to locate our Airbnb I had to call the host for coordinates, otherwise we would have spent an hour searching. The cottage house was small but as delightful and beautiful as it looked in the pictures. Even though the moonless night didn’t allow us to admire the ocean, a magic ambient was all over the place. Next morning, I woke up while it was still dark, took my tripod and walked out. It was chilly but there was no wind except for a small breeze picking up from time to time and then stop. I could hear the grass leaves barely moving but other than that, silence. It didn’t take long for the blue hour to come and cast its first light revealing the outline of the Great Blasket island. 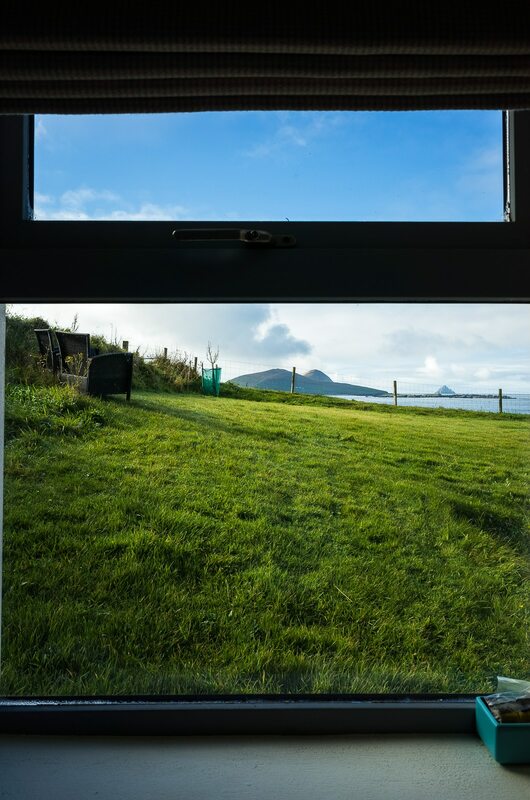 Teraght with its pointy silhouette was just behind it and next to it, the “sleeping giant” or “dead man”—as Inishtooskert island is called, lived up to its name by looking as humanlike as ever. I got a few shots trying to combine the landscape with the seascape just behind it, but it didn’t really work as I had hoped to, because of the neighbor’s yard that was in the way. “Well, photography is like fishing, most of the times you come back empty handed” I shot a couple frames more and went back to bed. We had hoped to have the eco tour around the isles and perhaps spend a night at the Great Blasket Island but we were a day late for the former and the unpredictable weather made the latter a risky choice because we could get stuck there for several days. Not a bad prospect but there was just not enough time. Too bad since I was hoping to watch bird colonies on the islands and maybe whales and dolphins. 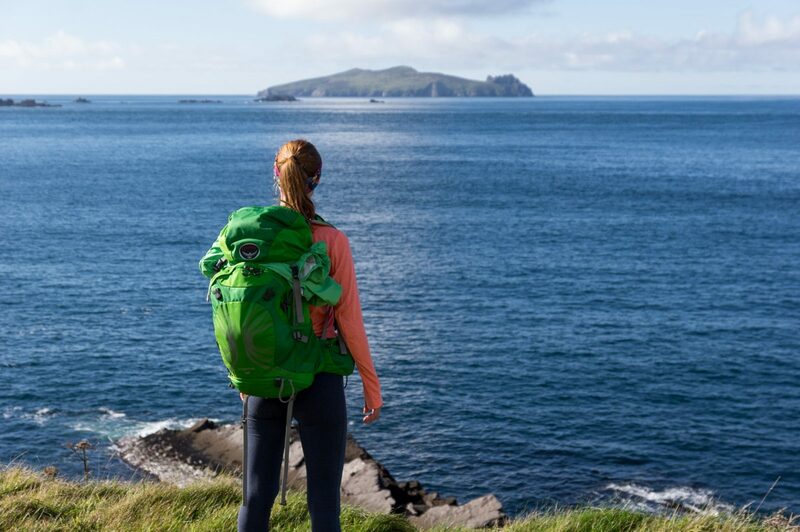 We would have more time for Dunquin and its coast instead. The harbor seemed like a good starting. While walking through the village, among the green pastures with the small houses and the ocean in the background, I admired the way that this old community was built in harmony with nature. There was nobody around around save for a few sheep and cattle. 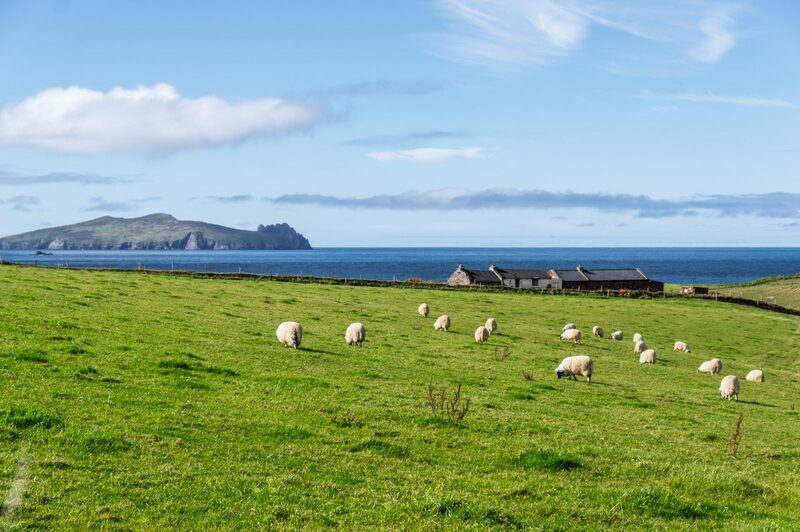 Usually contained by stone walls inside a green field, Irish sheep are always marked by the owner’s colors, something that makes them look like modern art in a rural themed canvas. The old harbor is two minutes outside the village, at the bottom of a steep and very well protected cliff bay. A narrow concrete road spirals down to the small pier which was and still is the place where boats leave for Blasket Islands. All supplies had to go through this little harbor in order to—weather permitted—reach the islanders. Some days of the year, flocks of sheep are still being moved to and from the islands, flooding the road to the sea and creating an impressive spectacle. Miraculously that morning, there was no wind and the ocean was as calm as a millpond. A young man greeted us on his way up from the dock where people were working on dismantling a curragh to store it for the winter. Curraghs are traditional boats found in Ireland and Scotland. They have a wooden frame which is covered with canvas and resin nowadays as opposed to animal skins and tar that were used in the past. Even stripped down, it looked pretty heavy and these people had to exercise great strength and endurance in order to carry it up the steep hill. We went all the way down to the pier but I took my shots from higher up since the dock is surrounded by cliffs, and two massive pointy rocks that protrude out of the water on the harbor’s entrance don’t leave a margin for much to be photographed. Next, we took the coastal trail heading north. 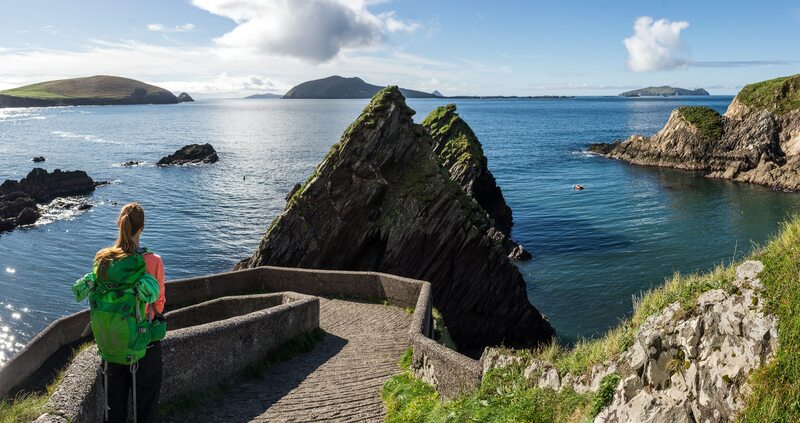 It’s a very scenic route with some great viewpoints offering mesmerizing views, sometimes to the left towards the sea and the “sleeping giant” and others to the right where Dunquin and Mt. Eagle are. The trail was flat and easy. At some points we had to go over fences and stone walls but there were steady ladders there to help with the access. Another famous site, perhaps the most famous of all, is the abandoned schoolhouse which was a part of the movie set for “Ryan’s Daughter” (1970). The movie was about an English officer who fell in love with a married teacher during World War I in a fictional village called Killary with Robert Mitchum starring as the cheated husband. Even though the movie didn’t go as expected it was a turning point for the local community which had the whole crew there for almost a year back in 1969. A small village was also constructed next to Dunquin but it was demolished soon after the shooting was over leaving only the schoolhouse as a proof that a big multimillion production ever took place there. The old building is still standing and though the roof has fallen, it still retains its charm and the view of the bay from its front yard is amazing. Resuming our little hike, we crossed the Slea Head drive and climbed a small hill southeast of Clougher Head which gave us a great angle on the headland and the scenic little beach among the cliffs that goes by the name Clougher Strand. It was a great spot to set a tripod and the fact that the weather was perfect that day made it even better. The sky was clear with just enough clouds far in the background to make it interesting and the Atlantic had a very bright navy blue color that you rarely get. All in all we spend more than five hours around Dunquin that passed really fast. A short stroll through the village took us back to our place for a quick shower before hitting the village’s pub for a pint. Kruger’s pub is known as the birthplace of CAMRA (Campaign for Real Ale) as well as for being the westerner pub in Europe. In reality it’s a proper village pub with very simple decoration and a dark mood. 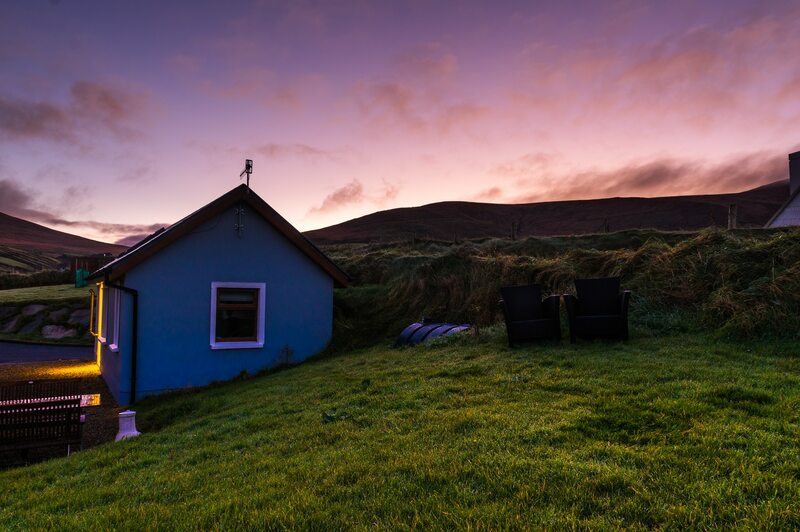 The locals go there after work to have a drink and socialize—always in Gaelic. The lady behind the bar was very jolly and the Guiness pints were as fresh as anywhere in Ireland. It doesn’t get more original than that. I have a soft spot for small places like Dunquin but the fact that it was the highlight of my trip to Ireland says a lot for this amazing little village on the verge of the Atlantic Ocean. For me it’s even more worth visiting than other more famous and still great places like Killarney or the Cliffs of Moher. 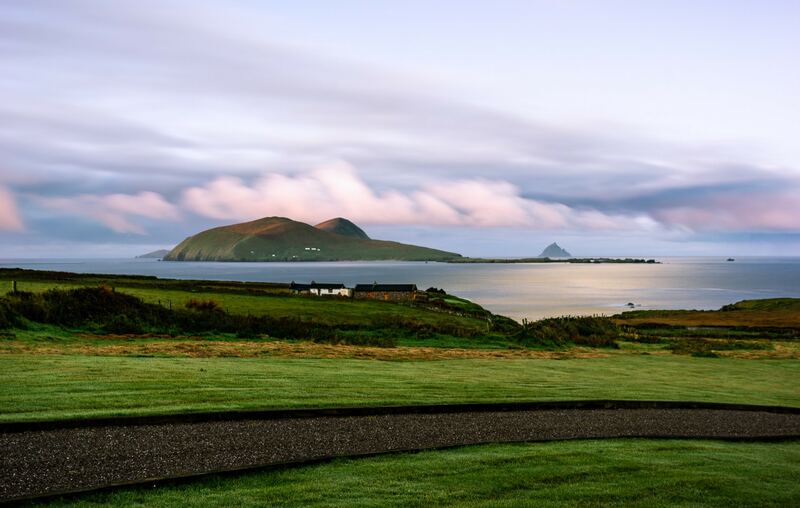 It is the heart and soul of the Emerald Island. Oh nice. The full-screen images are looking gooood. That makes the blog look very modern. And the video, what did you use for it? I think there is some drone footage? Thank you! It’s also a way to do justice to Dslr shots since image size is one of the strengths of a proper camera. The video is a combination of a Phantom 4 Pro and a Samsung S7 on a gimbal. Thank you! I know but truth to be told no matter how wonderful the Cliffs of Moher are, I was immediately put off the moment I drove into that parking and saw the thousands of people that were there. Love hearing about new places like this especially when It’s a bit off the beaten path ! 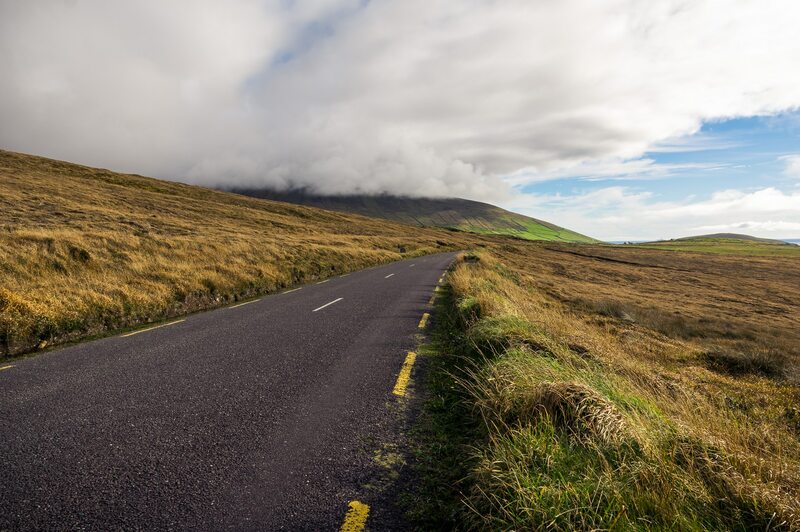 I’m a truly nature lover so I would definitively love to visit Dún Chaoin 🙂 Ha, ha an enduring image of Ireland is a narrow country road filled with sheep. Dunquin Harbour seems one place where you can see that, with the added bonus of an incredible backdrop !! The landscape looks so beautiful and the sky has out-of-this world colours! Looks like a lovely place I would love to explore at least for one summer! Wow! Your pictures are simply spectacular. The one of the road looks like a Windows Wallpaper or something. 🙂 This village is beautiful in its own right, set amidst the beauty of nature. PS: Which camera do you use? we are just starting out on our photography journey and would love it if you could make a suggestion. Thanks. Thank you! Yes, this place is something else, isn’t it? I use a Pentax K-3II right now. It is a great camera as all Pextaxes are. Their value for money is amazing for a weather resistant camera. BUT due to terrible customer service I can’t recommend you to buy one. You can read my horrid experience with them here. They treat their customers like they don’t exist and it’s not just me. I’m looking to change system myself actually and I’m leaning towards Sony at this point. Mirrorless cameras are the future, so if you are going to invest money to a system it’s probably better to go that way.